Developer: Konami Computer Entertainment Studios, Inc.
Squint, and you'd be forgiven for thinking that this was indeed Gran Turismo - this really is the epitome of a Gran Turismo clone. 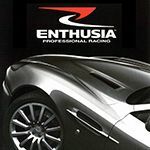 From Konami, Enthusia is a PS2 exclusive racing simulator, boasting over 200 cars and impressive driving physics, but had the misfortune of being released a few months after the almighty Gran Turismo 4. Due to this I'm doubtful if the game was much of a success, considering that many don't seem to be aware of its existence. On the surface it does indeed seem to have much in common with Gran Turismo - the shiny graphics and real cars are extremely similar, but the games main career mode is far different. Instead of the standard earn cash and tune your car up standards, Enthusia instead relies on driving skills, which arguably works better. Then we have the car lineup - up against Gran Turismo 4, its car count of 211 seems a little unsatisfactory compared to its rivals 700, but on the other hand Gran Turismo 4 contains 40 Nissan Skylines so it is far more even. Overall it is a good little game, but painfully hard if you do not have access to a steering wheel - I must say I prefer Gran Turismo 4 as it outshines it in almost all aspects but you have to give Konami some credit for stepping up for the battle. The PS2 version of Forza Motorsport no doubt? You could put it like that, but it was a good title in its own right. A Chevrolet Astro? I love oddball choices in driving games. And any game that has an E30 M3 is fine by me. I remember this game, when i drove the Nissan "Moco" LOL. Was it a green Moco? Isn't there a DS in this game? I think so, it also had the first contemporary Range Rover in a game which was just bliss for me. I will be updating this page since I have the game. Too Bad not to Many Classic Cars were featured such as the Aston Martin DB4 etc. I have this game. It's fun at first but it gets boring after you've unlocked practically all the cars. Rinspeed, there's a way to turn off the HUD for shots I think? Best Gran Turismo clone ever! Yeah, I agree. It's annoying in career mode if you want to get a certain car, and you keep winning the "wrong" ones! But otherwise, a very good game! subzero wrote very good game..
Do you have tuning in this game? At least mechanicaly. The second best racing game. Should really have a 2. I find this game very enjoyable to play (I've realized it only now since I finally unlocked all the Audis). Very good graphic, great tracks, but the best thing for me is how the cars handle when you disable the driving helps: you can easily do drifts (Gran Turismo 4 is worse in that way). Also, the snow track is far better than the GT4 ones: the driving in this condition is more realistic than his rival game. Well, Gran Turismo 4 is a great game. But when I need to play a pure enjoyable racing game, I take Enthusia. walter wrote I find this game very enjoyable to play (I've realized it only now since I finally unlocked all the Audis). Very good graphic, great tracks, but the best thing for me is how the cars handle when you disable the driving helps: you can easily do drifts (Gran Turismo 4 is worse in that way). Also, the snow track is far better than the GT4 ones: the driving in this condition is more realistic than his rival game. Also,i think is easier to perform drift in Enthusia. I can perform a long drift easily than in GT4. And surprisingly. I found Enthusia's driving physics is slightly similar to LFS. It has one of my favorite selections of vehicles in a game too. It's just so varied. Cadillac STS, Chevy Astro, Skylines, vintage Americana, exotics, SUVs, Citroen DS, the list goes on. FM4 is getting close, and GT4's was decent as well, but for now I think Enthusia wins the eclecticism selection. Man, 2005 was filled with GT clones. PGR3, Forza 1, Kaido Racer 1 and 2, and even this game. Anyway... I only wish Konami does port it to the Wii or something like that, even sequel will be awesome! ItsaUserName wrote Man, 2005 was filled with GT clones. PGR3, Forza 1, Kaido Racer 1 and 2, and even this game. Out of those, I'd only classify Enthusia and Forza as "GT clones". Anyways, TBH I hate the whole ">insert game here< clone" term anyways. I actually like those games as they brought different stuff to the table. I was simply generalising them. the carrer mode was so damn confusing. But I still liked the game esp. because of the unusuall cars. Old comment, but I'd like to give some info anyways. To unlock Race cars, you have to reach rank 50, which you'll gain access to RS rank races. Some RS rank races will give you a race car. Then on, use that car you unlock to unlock the rest! CrazyCars wrote Isn't there a DS in this game? The game is not released on DS plus a Nintendo DS cannot handle those graphics! !